If you are a cat owner, you know that felines are cute sleepy heads, so, unless you want to keep sharing your bed with your furry friend, you’d better start looking for a product that can make him or her feel loved and protected. You will find many cat gadgets out there and you have to consider a lot of features when you buy one. We want to help you choose the best product, so we’ve made a list with units that meet all the necessary criteria. You can choose this bed regardless of your cat’s size or breed. Every time your pet sits or sleeps in this unit, it will be pampered by the faux lamb and wool plush covering. Also, the non-skid bottom makes the product stable even when your feline is full of energy and feels like playing before it falls asleep. The product is very safe; it doesn’t use electricity to warm, so you don’t have to plug it. The Aspen Pet self-warming bed pleases your feline thanks to the heat-reflecting technology; this means that it uses the pet’s body temperature to keep him or her warm. This cozy bed is made of top quality premium pet-safe, machine washable fabrics. It is stuffed with virgin AirLOFT fibers that make it flexible and easily adaptable and the bottom is waterproof, so your cat will feel comfortable and safe in any sleeping position. The Best Friends by Sheri Cuddler is also called OrthoComfort thanks to its’12” high rear bolster wall that will ease the pain in your cat’s joints. Also, it is provided with a 9” front wall that ensures extra orthopedic support for the feline’s head and neck. The item is available in two sizes and you can choose your favorite from several color options. The AmazonBasics is a cat owner’s must-have. Its round shape and pillow-like surface welcome your beloved feline in a cozy atmosphere thanks to the soft, pampering fabrics used for creating it. The product has a top surface made of plush flannel for extra softness, while the sides and the bottom are made of polyester canvas for supreme strength. Its trendy features make the AmazonBasics suitable for many home decors. You can wash it separately in the machine, but you have to let it dry completely before using it again. It measures 20 inches and weighs 1.1 pounds, so you can easily carry it around the house. Cats are full of energy and we know that they can be quite a handful. In order to keep them occupied, Trixie Pets has thought about enlarging the family of good cat scratchers with this practical item. The Miguel Fold and Store Tower is ideal if you don’t have much space at home. When your furry friend is not using it, you can simply fold it and store it anywhere. The multifunctional item gives cats the possibility to play with the hanging toys, sharpen their claws on the resistant sisal scratching surface and sleep if they crawl inside the comfortable condo softly padded with a plush insertion. The Aspen Pet Animal Print Round bed measures 18”, so your cat will have a generous personal space. The product will develop your feline’s nesting instinct because it is provided with raised bolstered sides that make your friend feel safe and cozy. The item is softly filled with a comfortable, high-loft recycled polyester fiber fill that will make your pet feel at home and you won’t have to share your bed anymore. Next to the eye-catching look, the Aspen Pet unit has practical features also. It’s lightweight, so you can easily transport it around the house and it can be washed in the machine. The Armarkat Cave Shape Bed is the perfect refuge for your cat. Regardless the season, it will pamper your pet with maximum comfort thanks to the soft velvet covering and extra thick fill made of 100 percent poly. The skid free base gives the Armarkat Cave Shape Bed all the necessary stability. Also, don’t think that the unit might get wet easily, because it is waterproof. Your cat will be happy to sleep in this cave-shaped hideaway because the bed is built according to all quality standards. Furthermore, the product is very easy to clean; it can be washed in the machine. MidWest designers seem to have read many cat books before they created this innovative product. This pet cube is a strong and sturdy construction that totally understands your cat’s instinct to lounge and play all day. 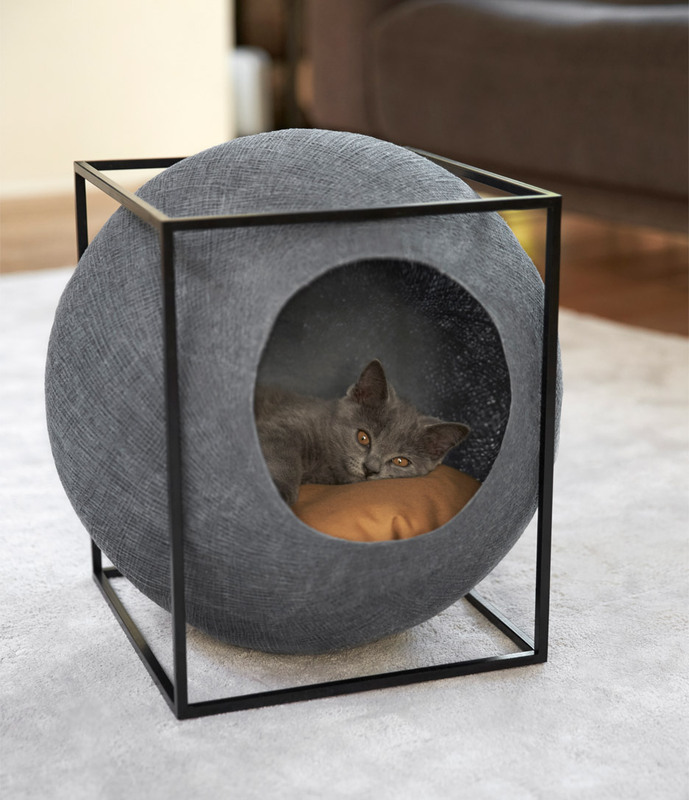 The MidWest cube is made of a cushioned bed topper with stuffed bolsters and includes a plush hanging ball, so it has everything a cat needs to be happy. This practical, multifunctional cat house can easily be assembled and folded down when you want to store it. The inside is very spacious and therefore felines of all sizes have enough room to play and sleep. If you want to offer your pet an eco-friendly place to take a nap or play, the iPrimio made from 100% natural merino wool can be a good choice. Shaped like a cave, this item will become your cat’s favorite hiding place. iPrimio is a super soft, handmade product that creates a cozy, welcoming environment for your feline. Also, being made of natural wool, the bed is safe, antibacterial and unpleasant odors won’t bother your furry friend. The iPrimio’s inside is very spacious and the hideout hole is very large, so the item is suitable for cats of all sizes. Your beloved feline deserves the best treatment and the Armarkat bed can take him or her into the world of total comfort. Based on what we found about it, the product is available in a round or oval shape. Of course, there are also several color options, so you can choose the one that will fit in your home décor. The Armarkat Round or Oval Cat Bed is very comfortable and your pet will love it. It is made of soft velvet and faux suede and filled with an extra thick layer of polyester for extra softness. The product is waterproof and very stable, thanks to the skid free base. Nowadays, pet toys and accessories are not like they used to be. If you own a cat, the situation is even more difficult. You have to make sure that your feline has a safe, cozy and special place where it can play and sleep. The Cat Craft 4308601 15 Inch Tunnel is a contemporary cat bed which features a soft padded plush area with the purpose of creating your pet’s perfect playground and relaxing sanctuary. Ingeniously shaped like a tunnel, the item provides enough space even for over-sized cats. It has solid wood feet for better stability and safety. Owning any type of pet requires dedication and commitment, especially for those you plan to keep indoors. This means that, from now on, your apartment will make your pet’s entire universe, so you need to make it as comfortable as possible. Although cats are easier to adopt than dogs because they don’t require taking them outside every morning, owning a cat will automatically make your entire life revolve around the supreme master of the house – your new furry pet. So, aside from keeping them safe, pampering them, and offering them the best available gourmet food, cats will also require their own place to stay and contemplate about life. Cats can sleep up to 20 hours a day, so imagine how unpleasant how uncomfortable would be for them to keep on bothering and waking them up trying to go to sleep in your bed. As a result, finding cool cat beds could prove quite the challenge, especially since there are plenty of options available on the market. From size to depth, the fabric used, and other specific features, you need to look carefully if you want your furry friend to sit back comfortably while trying to take over the world. Finding the best cat beds is no easy task since your beloved cat can be extremely picky. If you lack the necessary time to wander through stores in the search for the perfect cat bedding, we suggest reading our following shopping guide and find out the most important features you need to take into consideration. First of all, you should know that there are plenty of online blogs, forums, and websites specially dedicated to cats, so finding some good cat beds will not take you too long. We suggest reading cat beds reviews and viewing which items are for sale or even asking other customers to share their experiences. It is important to read as much as possible before deciding on which type of bed will best fit your cat. Compare different manufacturers with different bed sizes, materials used, and prices. You can even compare cat collars with other cat owners to make sure you do everything you can to ensure a safe and loving environment to your cat. Cats are wonderful creatures with majestic moves, but they are also highly sensitive to wind and cold. They love warm environments and cuddling next to their humans in safe places. If you plan on teaching your cat how to sleep alone, a heated cat bed would probably make a great investment. These are good both for winter and summer, as cats love to stay in warm and fuzzy places. There are plenty of online categories to choose from, but we suggest investing in a bed similar to an electric blanket, which doesn’t heat more than the optimum temperature. This will definitely become the best cat bed mat. After all, you want your pet to feel comfortable, and not like it’s on fire. Moreover, if they don’t feel like the heated bed does them too much of a favor, they will simply look for warmer places around the house. So, don’t be surprised if you’ll find your cat sleeping on your sheets or blanket, near the fireplace or on a heater. 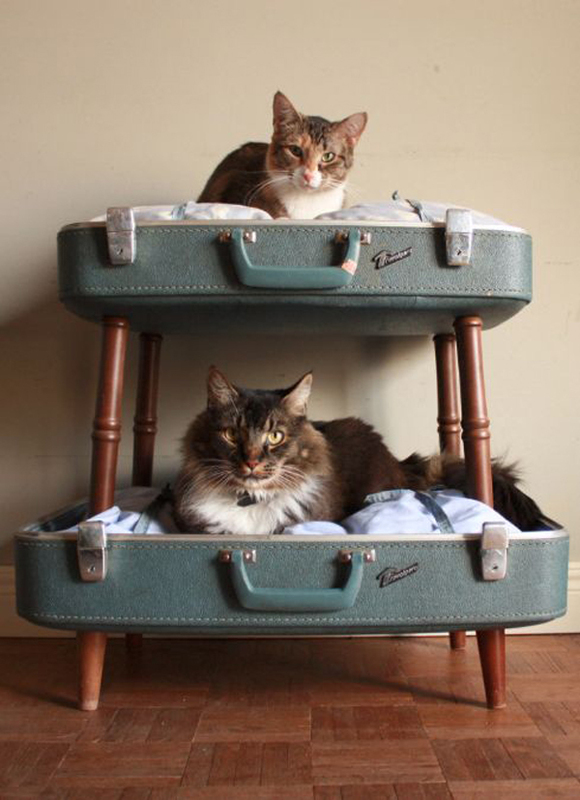 These beds are specifically designed to provide the maximum comfort and education to your cat. These trees often include a bed on top, and a large playground on the bottom, with plenty of things to do and trick to learn. You can even purchase a tree if you have more than one cat, as these trees can be added as many “branches” as you can, as long as they’re safe to use by your pets. A cat bed tower is also a great place to stimulate your cat’s curiosity and exercise capabilities. Keep in mind that cats need constant physical exercises and stimulation in order to maintain fit and agile. Since it is almost impossible to take your cat for a daily walk in the park or have it play in the garden during the day, these bed towers remain one of the few sources of indoor fun and physical activities. In addition, you can consider adding some new cat toys to stimulate their natural curiosity and determine them to learn more about the surrounding environment. These one are made to stimulate the natural sleeping environment for cats. An enclosed bed or a cat bed egg resemblances a closed, safe, and warm environment where your animal can get a good night rest. Always remember that cats can sleep almost all day long, and a bed shaped like an egg, complete with warm and soft walls and a fluffy mattress would provide the required comfort. With different types of bedding comes different types of materials used for manufacturing these cat sleeping places. If you consider purchasing a cat tower, keep in mind that the carpet must be brand new and not made of old, recycled or chemically cleaned carpets that are made looking like new. If you’re not sure about the provenience of the carpet, you can ask for additional information or simply reorientate towards a different product. As a general rule, we suggest opting for natural fabrics, free of bleachers and chemicals used for cleaning. Most of these substances are toxic and can impregnate into your cat’s fur on the long run and cause rashes, itches, and dermatological problems. You can try opting for soft cotton, wool, fur or even a blend of poly fibers and microfibers, as long as they were not previously chemically treated. But, no matter what you choose, one thing is for sure – the beds should be heated or at least warm enough to provide a cozy environment for your cat to properly rest during the night. Last but not least, you also have to take into account the resistance of your cat’s bed. Cats can easily become overweight and even obese if they lack constant physical training, so you need to make sure the bed is resistant enough to support your cat’s weight. This is especially important if you opt for tower beds because some of them are known for having a flimsy, unsafe base.